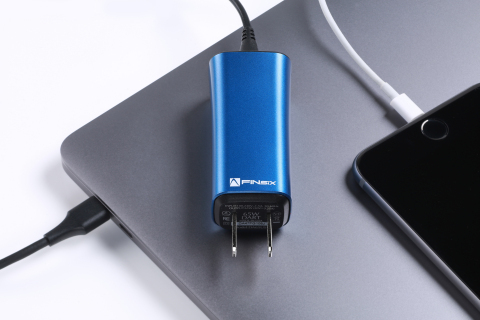 MENLO PARK, Calif.--(BUSINESS WIRE)--FINsix Corporation (FINsix®), manufacturer of DART®, the world’s smallest laptop charger, today announced DART-C, the world’s smallest charger for USB Type-C laptops. The DART-C furthers the FINsix commitment to providing an unprecedented level of portability for on-the-go consumers and business travelers by enabling them to ditch their bulky bricks and USB chargers. DART-C is a powerful 65-watt laptop charger that is up to four times smaller and lighter than a traditional A/C adapter. The additional built-in USB port allows for simultaneous charging of another electronic device, like a phone or tablet. With the addition of DART-C, the DART family of chargers expands its ample reach of supported laptops to include Apple MacBook and MacBook Pro, Dell XPS 13, Lenovo ThinkPad 13, and ASUS ZenBook 3. DART-C will be available at FINsix.com and other resellers beginning in January 2017 for a price of $99.99. A USB Type-C cable will also be available at FINsix.com as an accessory to previous DART owners for $34.99. Like the DART launched in September 2016, DART-C comes in a variety of stylish colors, including blue, gunmetal, magenta, orange, and silver. FINsix Corporation, the worldwide leader in high-frequency power conversion technology, is bringing to market highly miniaturized power conversion products that offer unprecedented power density and excellent performance. FINsix is a spinout from the Massachusetts Institute of Technology LEES Laboratory. The company has 34 issued and pending patents and is based in Menlo Park, CA. FINsix’s investors include Cornwall Capital, Venrock Associates, Cranberry Capital, Apple Core Holdings, and Marubun Corporation. For more information, visit www.FINsix.com.